Dr Hui-Ying Kerr of Nottingham Trent University, a contributor to the University of Brighton’s recent international conference, reviews its contents and contexts. Recently, in design history, the importance of the international has been brought into focus, acknowledging the impact of globalisation and interlinking partnerships that frame competing localisms and histories. Fundamental to this is the concept of modernity and its various interpretations that distinguish and link these narratives of belonging and difference. 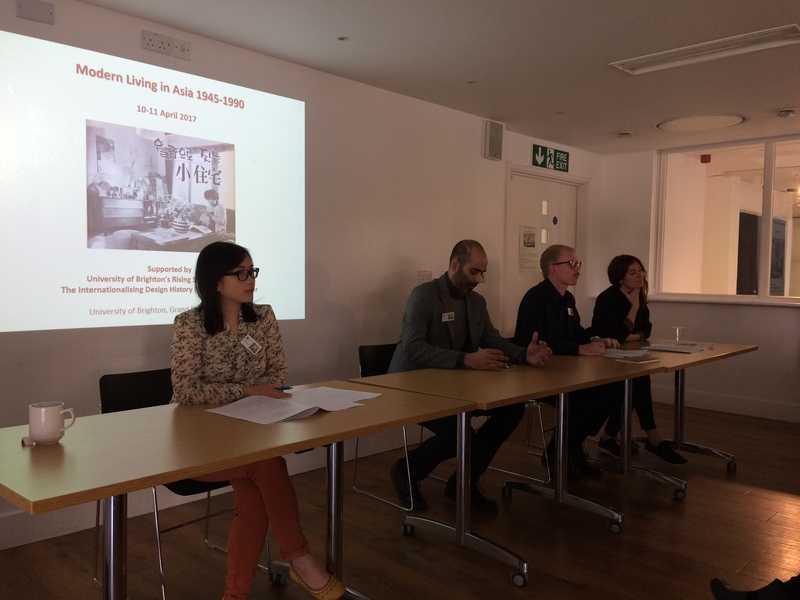 In this, the conference, Modern Living in Asia 1945-1990 (University of Brighton, 10th – 11th April 2017), was very timely. Recognising the multiple interpretations of modernity, it brought together issues of modular living, modern nation-building, cartographic meta-geography and transnational flows of design that are integral to the narrative of international modernity. Furthermore, by focusing on Asia, it highlighted the need to explore other histories outside the West, providing competing parallel narratives that show how modernity is not just a one-dimensional flow of West to East, but an explosion of simultaneous ideas and directives, irrespective of geographical positioning. Divided into five panels over two days, the conference was framed by two keynote speakers. Professor Gyan Prakash’s paper, Bombay to Mumbai: The Unhomely City and the Space of the Everyday, explored the historical-cultural development of Mumbai and showed how modern cities become spaces of opportunity and repression, a site for the attainment of impossible dreams, and the closure of possibilities by the rich on the poor. Within this framework, the chaotic ‘unhomeliness’ of the city can bring about a change in meaning of the home, where this desire, rooted in the tactics of survival, becomes a political act of defiance and exercise of a right to dream. Professor Duanfang Lu’s paper, Housing as Method: Rethinking the Culture of Contemporary Architecture, explored contemporary architecture as a culture and the concept of building as method, critiquing modern architecture as a monoculture that rejected the plurality of traditional building crafts, but which did not deliver on its promise of cost-effective, good quality housing for all. Instead, good modernist housing was limited to the rich, while the poor made do with substandard materials and design, the unpopularity of which has led to the development of kitsch and Western classicism pastiche in mass-produced affordable housing. However, the architectural scene has hope, with developments that include a rediscovery of traditional crafts and methods, open-source architecture, and regionalised mass-customisation. In the first two panels, Constructing National Identities and Modernity and Public Spaces, the development and articulation of national identity in the second half of the twentieth century was a common theme throughout. Ilmin Nah’s Imagining Cultural Modernity in Global Nation: The Construction of the New Building of the National Museum of Modern and Contemporary Art in South Korea during the 1980s, and Ziad Qureshi’s A Distanced Modernism: Identity, Unity and Authoritarianism via Academic Campus Residential Architecture in East Pakistan 1958-1871, both looked at the complexities surrounding the use of institutional architecture in articulating new nationhood in a modernism that drew on and tried to distinguish itself from its turbulent histories of colonisation and independence. Meanwhile, Loretta Lou’s A Brief History of ‘Green Living’ in Hong Kong (1970-1990), and Jesse O’Neill and Nadia Wagner’s Swimming in Modern Singapore, explored the development of ‘wholesomeness’ programs of environmental responsibility, health and athleticism as civic duties that formed the citizenship of new East Asian island nations. In listening to these papers, one can see how the planning and implementation of institutional programs is a complex process that has implications in the development of multiple nationalisms and modernisms, beyond that of its immediate beginnings. In the third panel, Modern Living Discourse through the Print Medium, the theme of methodology was the distinguishing feature, with innovative findings drawn from the analysis of different types of print. Jhee Won Cha’s To Live or not to Live in Apartments, that is the Question; Apartments’ Symbolism of Postcolonial Modernity in the Korean Modern Literature of the 1980s, used Korean literature to explore the shapes, sizes and spaces of Korean mass housing, as well as their cultural significance through characters uprooted and displaced. Sandy Ng’s Gender, Design, and Modern Living in Twentieth Century China, meanwhile, used the depictions of women in free Chinese calendar posters of the early twentieth century to examine the design implications of cross-cultural flows of goods and ideas, where Chinese women became the point of entry for the ‘indigenisation of modernity’ and cross-fertilisation of culture. Carrying on this theme of women as contested site of modernity, my own paper, The Well-Travelled Woman: Hanako Magazine and the International Women of the Japanese Bubble Economy, used Hanako Magazine to demonstrate how modernising narratives of internationalisation were used by Japanese women of the 1980s to articulate their privileged status, but which ultimately derived from a fundamental lack of privilege that did not benefit from the opportunities of the Japanese Economic Bubble. The fourth panel, Modernisation: Design, Ethics and Philosophy, examined issues of modernity as living space, with papers exploring the articulation of a specific localism of modernity, tied to a particular chrono-cultural meta-geography. While Nirodha Dissanayake’s paper, Modern Living in Rural Sri Lanka: A Case Study of the Mahawell Architectural Unit, Sri Lanka 1983-1989, exposed the difficulties that specific local issues could bring to a project, Deniz Hasirci and Zeynep Tuna Ultav’s The Westernisation of a Nation: Modernist Furniture Design in Turkey and Jin-Mool Choi’s The ‘Fung Shui’ Theory in the Living Space of Modern Asia both showed how the implementation of local perspectives and interpretation of tradition could create unique and diverse manifestations of modernity as living. The final panel, Transnational Exchanges, focused on the influence of transcultural flows of ideas and designers. Yola Gloaguen’s Bringing the Vernacular into Modernism – The Residential Works of Antonin Raymond as the Illustration of a Post-War Architecture Expression of Modern Living and Izumi Kuroishi’s Impact of American Culture on the Post-War Japanese Detached House Design both explored the impact of Western influences of modernity on the modern Japanese house, while it was the influence of Japan’s Metabolism movement and its single planning vision of city housing, that could be seen in the mass-housing Iranian mega-structures of Seyed Mohamad Ali Sedhighi’s Megastructure Reloaded: A New Technocratic Approach to Mass Housing Development in Iran, the Example of Kuy-e Ekbatan. Meanwhile, Bai Hyoung Park’s Modernisation and Postcoloniality of Seoul, the Capital of Korea – Focusing on the Development of the Area Itaewon exposed how proximity to the dualism of US military bases inside Seoul has led to the permutation of Western norms and ideas into the surrounding areas, creating special zones of transnational exchange and permissibility within a Korean capital city. As part of the conference, attendees were also taken round the Waste House, a collaboration between the University of Brighton, City College Brighton and Hove, and Mears Group, which is made up of over 85% upcycled waste materials. This award-winning building, completed in 2014, shows us how the concept of modernity is always changing, with new challenges in environment and attitudes framing our understanding of what it means to live in modern responsibility. This brief snapshot demonstrates both the sheer extent of topics available – from museums to magazines – and how a focus on Asia can change our very conception of modernity. With the range of possibilities breathing new life into our understanding of living in the modern, we see not only how fascinating, but indeed vital this research is, and look forward to more much-needed work coming to the fore.